All Crises Are Global: Capital Cycles in an Imbalanced International Political Economy. What factors generate financial fragility in open economies? Existing research assumes that the development of these conditions is more likely to emerge under some configurations of domestic economic and political attributes. We examine the development of financial fragility through the ontological lens of the New Interdependence approach, which assumes that global factors can be as important as local factors in generating outcomes. We analyze global financial conditions from 1978-2009 and argue that contemporary global finance is an oscillating system that generates “boom and bust” capital flow cycles. The phases of this cycle are a consequence of the scale of US net borrowing on global markets: when the US is a large net importer of foreign capital, other economies struggle to attract foreign capital and are substantially less likely to develop fragile financial positions; when US net capital imports fall, other economies receive an abundance of foreign capital and financial fragility becomes more likely. In contrast, we find little evidence that cross-national variation in political institutions or financial systems explains why fragility develops, although some regional interdependencies are evident. We conclude that global conditions drive the probability of crises occurring someplace in the system, while local outcomes appear to be idiosyncratic. Bauerle Danzman, Sarah, Thomas Oatley, and W. Kindred Winecoff. 2017. "All Crises Are Global: Capital Cycles in an Imbalanced International Political Economy". 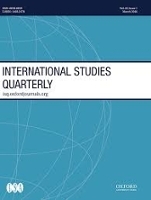 International Studies Quarterly, forthcoming.